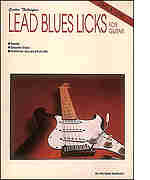 This book examines a number of blues licks in the styles of such greats as B.B. King, Albert King, Stevie Ray Vaughan, Eric Clapton, Chuck Berry, and more. Varying these licks and combining them with others can improve lead playing and can be used in rock styles as well as blues.